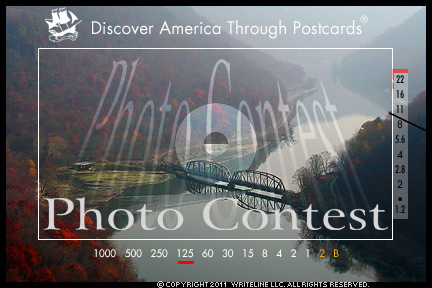 This week in honor of Columbus Day, we're announcing our annual "Discover America through Postcards" photo contest. The purpose of the contest is to showcase six photos of interesting sites in America--North, South or Central America--that will inspire viewers to want to learn more. So, rifle through your photo files and give us your best shot of a special place in the Americas, one that captures the beauty, history or curiosity of the location, something truly inspiring. Submit your photo today to our 9th Annual Discover America through Postcards photo contest. See how easy it is. The winner of the $100 Grand Prize will be announced on March 13, 2012. All finalists will receive an autographed copy of the companion book, Discover America Diaries. The grand prize winner receives an autographed copy of the book plus $100. Photo submissions can be color or black-and-white from either film or digital cameras, but must be accompanied by an entry form. Enter today, or forward this email to any photo-talented friend or relative. Good luck. You are receiving this email because you subscribed to the "Discover America Through Postcards" weekly email. To ensure delivery straight to your Inbox, please add america postcardsfrom.com to your whitelist. Postcards From America, P.O. Box 777, Bethlehem, New Hampshire 03574. 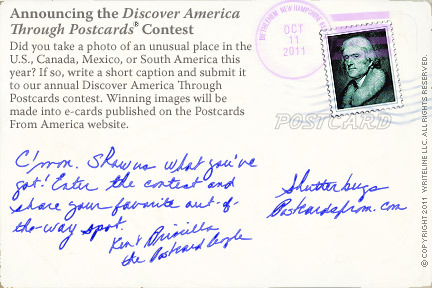 "Discover America Through Postcards," "Postcard People" and "Postcards From" are registered trademarks of WriteLine LLC. Copyright © 2011 WriteLine LLC. All Rights Reserved.